Most racers will tell you that they’re not big on being at the racetrack when they’re not in a racecar. It’s a tough reality to face and typically requires a lot of willpower to find the giddy up and go to head to a track to watch. Fortunately, I’ve got a long to-do list, plenty of tracks to check out and people to meet since I’ve recently relocated to Charlotte, North Carolina. Since moving here in March, I’ve been out to Hickory Motor Speedway for the NASCAR Whelen All-American weekly show, Orange County Speedway for the CARS race, South Boston for the Denny Hamlin Showdown, and twice to Carolina Speedway in Gastonia. On Friday May 8th, I went to Carolina Speedway to check out the Red Clay Rumble, a Renegades of Dirt race. Carolina Speedway is a 4/10 mile dirt oval and was originally owned by Humpy Wheeler. The Renegades of Dirt Presented by Arizona Sport Shirts is a Dirt Modified series that has national, north and south divisions, running all over WV, GA, PA, OH, and the Carolinas. I’ve always loved Dirt Modifieds even though I haven’t driven one yet. I’d say it’s because they look like the perfect combination of the open wheel cars I grew up driving (Midgets & Micro and Mini Sprints), and Dirt Late Models which I was fortunate to race a handful of races in (2010) thanks to Jerry Wald out of Chicago. I love dirt racing, and if I have to be a spectator, my choice would probably to be one at a dirt track. This was my second visit to Carolina Speedway and I must say, it is an awesome facility. Clean, fan-friendly, driver-friendly, accessible, enjoyable and affordable. Not to mention, only about a 40-minute drive from Charlotte. From talking to fans, I learned that they recently reconfigured the track, and as a driver it looks like a pretty racy little place that I would love to race at! I was fortunate to meet promoter Clint Elkins. His passion is evident and he does an excellent job of running a dirt show. Growing up, my best racing memories were those of dirt tracks but I must say, during those times, we solidified the meaning of “hurry up and wait” each weekend. At Carolina, they’re as prompt as it gets and make it worth everyone’s time whether you’re a driver, team member or fan. They’re also up to par on social media, which was refreshing! I interacted a bit with @CarolinaSpeed on twitter through the night and was surprised to see that they were on point with live updates. Their announcer is awesome at what he does, is an absolute hoot and does an excellent job of keeping the fans entertained during the little down time that they do have. They also take time to engage with the youngest of fans with their “Kids Club” where they call the kids up before the main event and pass out candy. While my plans are up in the air right now, getting out to the racetrack is always a good thing and I am hopeful that new sponsor-partner conversations will come to fruition and we will be back on track ASAP. The truth is, I can’t get away from this sport and I won’t give up on my love of racing. Stay tuned and please share, comment and like! 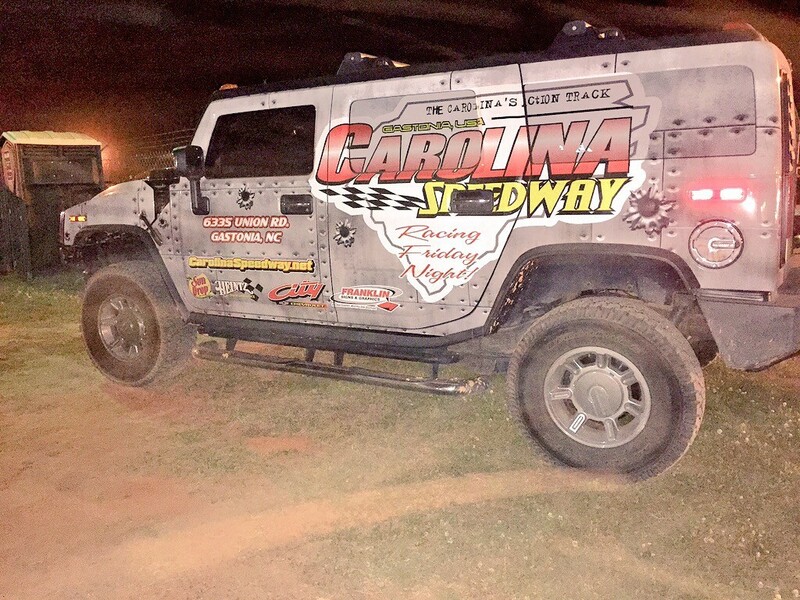 Be sure to check out and share the video I created from my trip to Carolina Speedway! Thank you for your support! Stay tuned for more.